AshleyMadison.com, a site that helps married people cheat and whose slogan is “Life is Short, have an Affair,” recently put up a half million (Canadian) dollar bounty for information leading to the arrest and prosecution of the Impact Team — the name chosen by the hacker(s) who recently leaked data on more than 30 million Ashley Madison users. Here is the first of likely several posts examining individuals who appear to be closely connected to this attack. It was just past midnight on July 20, a few hours after I’d published an exclusive story about hackers breaking into AshleyMadison.com. I was getting ready to turn in for the evening when I spotted a re-tweet from a Twitter user named Thadeus Zu (@deuszu) who’d just posted a link to the same cache of data that had been confidentially shared with me by the Impact Team via the contact form on my site just hours earlier: It was a link to the proprietary source code for Ashley Madison’s service. Initially, that tweet startled me because I couldn’t find any other sites online that were actually linking to that source code cache. I began looking through his past tweets and noticed some interesting messages, but soon enough other news events took precedence and I forgot about the tweet. I revisited Zu’s tweet stream again this week after watching a press conference held by the Toronto Police (where Avid Life Media, the parent company of Ashley Madison, is based). The Toronto cops mostly recapped the timeline of known events in the hack, but they did add one new wrinkle: They said Avid Life employees first learned about the breach on July 12 (seven days before my initial story) when they came into work, turned on their computers and saw a threatening message from the Impact Team accompanied by the anthem “Thunderstruck” by Australian rock band AC/DC playing in the background. After writing up a piece on the bounty offer, I went back and downloaded all five years’ worth of tweets from Thadeus Zu, a massively prolific Twitter user who typically tweets hundreds if not thousands of messages per month. 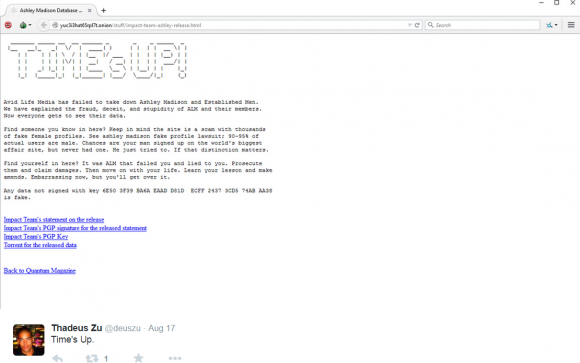 Zu’s early years on Twitter are a catalog of simple hacks — commandeering unsecured routers, wireless cameras and printers — as well as many, many Web site defacements. On the defacement front, Zu focused heavily on government Web sites in Asia, Europe and the United States, and in several cases even taunted his targets. 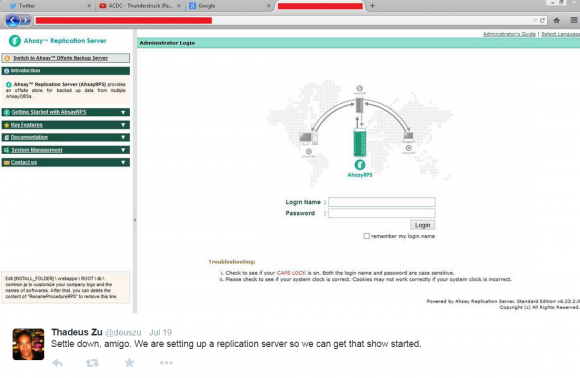 On Aug. 4, 2012, he tweeted to KPN-CERT, a computer security incident response team in the Netherlands, to alert the group that he’d hacked their site. “Next time, it will be Thunderstruck. #ACDC” Zu wrote. I began to get very curious about whether there were any signs on or before July 19, 2015 that Zu was tweeting about ACDC in relation to the Ashley Madison hack. Sure enough: At 9:40 a.m., July 19, 2015 — nearly 12 hours before I would first be contacted by the Impact Team — we can see Zu is feverishly tweeting to several people about setting up “replication servers” to “get the show started.” Can you spot what’s interesting in the tabs on his browser in the screenshot he tweeted that morning? 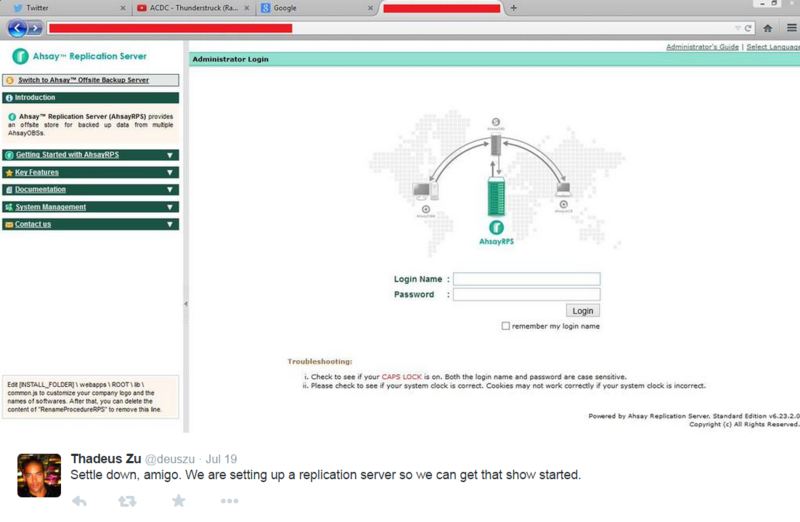 Twitter user ThadeusZu tweets about setting up replication servers. Did you spot the Youtube video he’s playing when he took this screenshot? A week ago, the news media pounced on the Ashley Madison story once again, roughly 24 hours after the hackers made good on their threat to release the Ashley Madison user database. I went back and examined Zu’s tweet stream around that time and found he beat Wired.com, ArsTechnica.com and every other news media outlet by more than 24 hours with the Aug. 17 tweet, “Times up,” which linked to the Impact Team’s now infamous post listing the sites where anyone could download the stolen Ashley Madison user database. 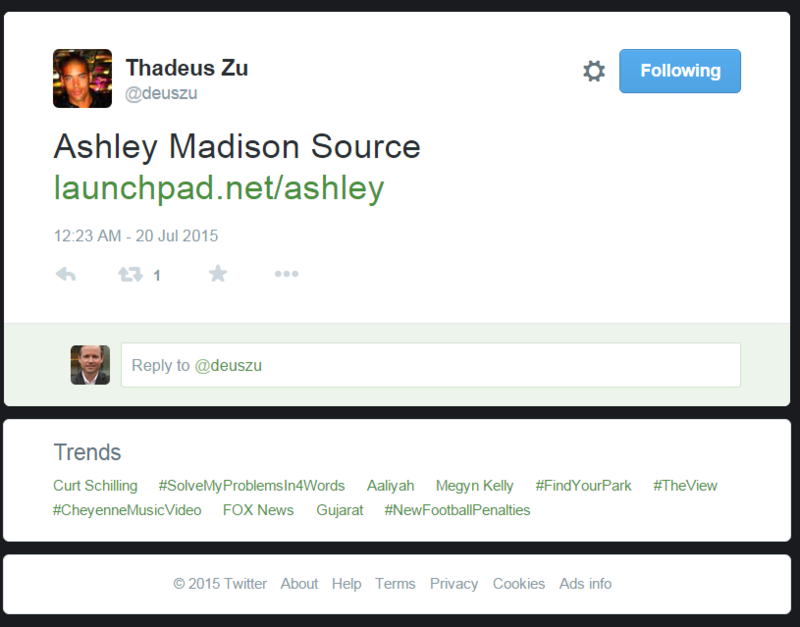 ThadeusZu tweeted about the downloadable Ashley Madison data more than 24 hours before news outlets picked up on the cache. Hacked online cheating service AshleyMadison.com is portraying itself as a victim of malicious cybercriminals, but leaked emails from the company’s CEO suggest that AshleyMadison’s top leadership hacked into a competing dating service in 2012. 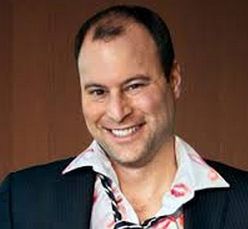 AshleyMadison CEO Noel Biderman. Source: Twitter. Late last week, the Impact Team — the hacking group that has claimed responsibility for leaking personal data on more than 30 million AshleyMadison users — released a 30-gigabyte archive that it said were emails lifted from AshleyMadison CEO Noel Biderman. A review of those missives shows that on at least one occasion, a former company executive hacked another dating website, exfiltrating their entire user database. On Nov. 30, 2012, Raja Bhatia, the founding chief technology officer of AshleyMadison.com, sent a message to Biderman notifying his boss of a security hole discovered in nerve.com, an American online magazine dedicated to sexual topics, relationships and culture. At the time, nerve.com was experimenting with its own adult dating section, and Bhatia said he’d uncovered a way to download and manipulate the nerve.com user database. Neither Bhatia nor Biderman could be immediately reached for comment. KrebsOnSecurity.com spoke with Bhatia last week after the Impact Team made good on its threat to release the Ashley Madison user database. At the time, Bhatia was downplaying the leak, saying that his team of investigators had found no signs that the dump of data was legitimate, and that it looked like a number of fake data dumps the company had seen in the weeks prior. Hours later, the leak had been roundly confirmed as legitimate by countless users on Twitter who were able to find their personal data in the cache of account information posted online. The leaked Biderman emails show that a few months before Bhatia infiltrated Nerve.com, AshleyMadison’s parent firm — Avid Life Media — was approached with an offer to partner with and/or invest in the property. Email messages show that Bhatia initially was interested enough to offer at least $20 million for the company along with a second property called flirts.com, but that AshleyMadison ultimately declined to pursue a deal. Many news sites and blogs are reporting that the data stolen last month from 37 million users of AshleyMadison.com — a site that facilitates cheating and extramarital affairs — has finally been posted online for the world to see. In the past 48 hours, several huge dumps of data claiming to be the actual AshleyMadison database have turned up online. But there are precious few details in them that would allow one to verify these claims, and the company itself says it so far sees no indication that the files are legitimate. Update, 11:52 p.m. ET: I’ve now spoken with three vouched sources who all have reported finding their information and last four digits of their credit card numbers in the leaked database. Also, it occurs to me that it’s been almost exactly 30 days since the original hack. Finally, all of the accounts created at Bugmenot.com for Ashleymadison.com prior to the original breach appear to be in the leaked data set as well. I’m sure there are millions of AshleyMadison users who wish it weren’t so, but there is every indication this dump is the real deal. A huge trove of data nearly 10 gigabytes in size was dumped onto the Deep Web and onto various Torrent file-sharing services over the past 48 hours. According to a story at Wired.com, included in the files are names, addresses and phone numbers apparently attached to AshleyMadison member profiles, along with credit card data and transaction information. 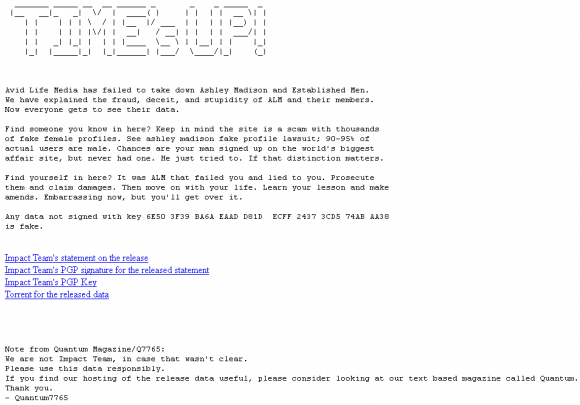 Links to the files were preceded by a text file message titled “Time’s Up” (see screenshot below). 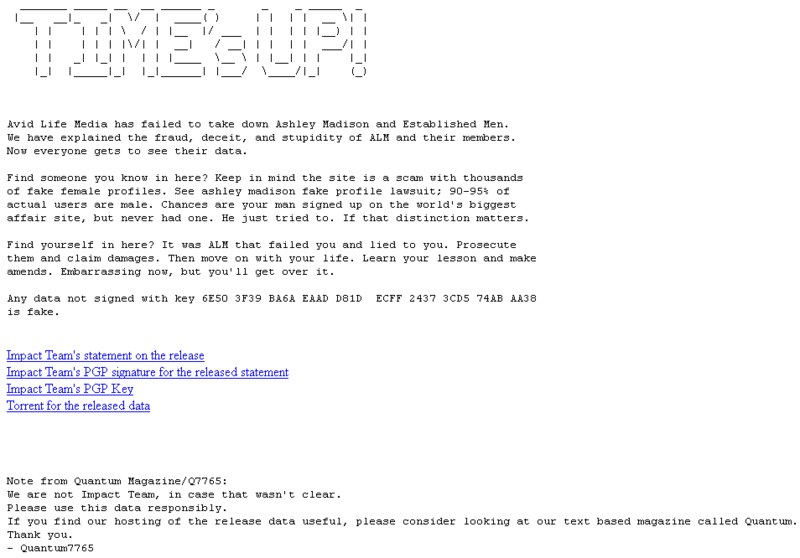 The message left by the latest group claiming to have leaked the hacked AshleyMadison.com database. From taking in much of the media coverage of this leak so far — for example, from the aforementioned Wired piece or from the story at security blogger Graham Cluley’s site — readers would most likely conclude that this latest collection of leaked data is legitimate. But after an interview this evening with Raja Bhatia — AshleyMadison’s original founding chief technology officer — I came away with a different perspective. Bhatia said he is working with an international team of roughly a dozen investigators who are toiling seven days a week, 24-hours a day just to keep up with all of the fake data dumps claiming to be the stolen AshleyMadison database that was referenced by the original hackers on July 19. Bhatia said his team sees no signs that this latest dump is legitimate. The former AshleyMadison CTO, who’s been consulting for the company ever since news of the hack broke last month, said many of the fake data dumps the company has examined to date include some or all of the files from the original July 19 release. But the rest of the information, he said, is always a mix of data taken from other hacked sources — not AshleyMadison.com. Bhatia said the format of the fake leaks has been changing constantly over the last few weeks. “Originally, it was being posted through Imgur.com and Pastebin.com, and now we’re seeing files going out over torrents, the Dark Web, and TOR-based URLs,” he said. To help locate new troves of data claiming to be the files stolen from AshleyMadison, the company’s forensics team has been using a tool that Netflix released last year called Scumblr, which scours high-profile sites for specific terms and data.